John Wells’s phonetic blog: trahison des clercs? some listeners to Today yesterday morning detected a certain trahison des clercs in the moderate opinions of Professor John Wells, the successor of Daniel Jones (alias Henry Higgins) at University College, London. He wouldn't say kil'ometre himself, he admitted, but that was because he was getting on a bit. (He is 71.) He knew better than to say mischievious, but he breathed no word of criticism of those who did. What had I said to give rise to this comment? I had done no more than make an objective report on some findings from the pronunciation preference polls I had conducted as part of the research behind LPD. As I truthfully stated, of the (British) people I asked about kilometre, only 37% had expressed a preference for ˈkɪləmiːtə, while 63% had preferred kɪˈlɒmɪtə. (By the way, the corresponding figures for Americans were 16% and 84%.) 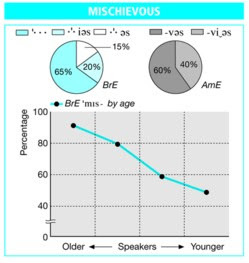 For mischievous, I reported that 65% of British respondents to my questionnaire had said that they preferred the pronunciation ˈmɪstʃɪvəs, 20% had voted for mɪsˈtʃiːvəs, and 15% had expressed a preference for mɪsˈtʃiːviəs. By reporting objectively on the views of a representative sample of native speakers of English, how could I incur the charge of trahison des clercs, of betraying the educated? True betrayal would be to suppress the honest and accurate reporting of people’s opinions. Unfortunately there are those who expect expert commentators to do no more than reinforce their own prejudices. But I report what I find. I’m glad to say that the article did finish on a more realistic, if patronizing, note. Professor Wells also knows enough to realise that if all the world says … kil'ometre, there is nothing that can be done about it. I was quite calm untl I saw 'haitch' and then I started frothing at the mouth. I live in Ireland and there is no-one who pronounces it correctly. I even heard a Professor of Linguistics use it on irish radio last year. The teachers at my son's primary tried to teach him to pronounce it that way. "Every normal man must be tempted at times to spit on his hands, hoist the black flag, and begin to slit throats. " It seems astounding to those of us who channel our interest in these matters into scientific investigation that some people seemingly wish to channel theirs into knife crime. (It hardly seems worth pointing out that this Telegraph comment was written by someone who cares about English enough to slit people's throats based on whether or not they use [h], but not quite enough to check their own typing). Just discovered your blog. I am not a native speaker of English, but I constantly strive to ensure that I speak and write correct English. Thanks a million for the blog sir! The phrase trahison des clercs means betrayal by, rather than of, the intellectuals. Julien Benda's original thesis (per Wikipedia) was that "French and German intellectuals in the 19th and 20th century had often lost the ability to reason dispassionately about political and military matters, instead becoming apologists for crass nationalism, warmongering and racism". This is, of course, exactly what the Torygraph expected you to do, specifically to uphold class standards at the expense of the truth. I do like the sentence "Ed Balls was educated at Oxford and Harvard, but there's no' a lo' of evidence in his pronunciation." What should he sound like, a random mixture of RP and Eastern New England? One shudders to contemplate it. At least he didn't blame Balls' supposed accent failure on his having gone to America. The phrase trahison des clercs embodies a view — whether seriously believed or ironically alluded to — that a prime function of the clergy is to enforce the dogma of the Church. For those who took it seriously, dogmatic certainty was necessary for them to feel really Christian. By analogy, for those who take language prescription seriously, dogmatic certainty is necessary for them to feel really 'educated'. The problem is that language dogma has so long been key to social mobility. Shibboleths were identified by the established ascendency, so the identification of shibboleths became central to self improvement —and to philanthropic or commercial projects aid the upwardly mobile. Either way, the dogma of correct English became more and more 'high stakes'. In fact, it’s often the successful ‘climbers’ who are the most serious defenders of prescriptive dogma. In Britain these tend to be the ambitious children of working class families who were given a leg up by what we call ‘grammar schools’ — free non-residential schools with competitive entry, once a feature of pretty well every town in Britain. For some of these achievers, the prescriptive dogma has been a useful tool for their advancement and the mastery of it has been a source of self-confidence. Christopher Howse comes across as a very different, far less serious defender of the dogma. He seems comfortable and familiar with the shibboleths, but no more than amused at the fuss over John’s non-dogmatic views. The stereotypical Telegraph reader is more serious, approving of the dogma as just another thing to be conservative about. Often this goes with a touch of anti-Americanism, so novel forms are stigmatised as American and alien, even ‘barbarous’. But the people I really object to are those who rationalise and justify what are really conservative prejudices. This happens more with grammar, but a few of the things John reported are attacked on grounds of spelling and/or etymology. Correction. No, the people I really, really object to are those who see the mastery of ‘correct’ forms as a morall necessity. Those who use stigmatised forms are dismissed as ‘lazy’. Whatever the nature of their attraction to prescriptivist dogma, its followers expect teachers and experts to lend support. When this withdrawn it feels — whether seriously or ironically — as the ultimate betrayal. I didn't realise that trahison des clercs originated as a metaphor. But I don't think this spoils my analogy. My earlier sarcasm aside... There is a legitimate debate to be had about whether, and when/where, it is a good idea to advise people to change their speech and writing habits. It's not a frivolous question. The anon commenter above shows that there are people who would very much appreciate some advice on which forms of English correspond to a more formal, or "correct", register. The problem is that many conservative, language-sensitive people expect academic linguists to dispense this sort of advice, unaware that this is not part of their job description at all. Hence the feeling of "betrayal" when they don't get such prescription. We shouldn't expect Prof. Wells to tell people "how to speak", any more than we should phone a biologist to find out how much exercise we should take. There may also be native speakers who don't quite understand the difference between developmental speech disorders and the established registers/dialects that simply differ from their own. There is a legitimate debate to be had about whether, and when/where, it is a good idea to advise people to change their speech and writing habits. 1. Whether the change will really benefit the speaker or writer. 2. Whether the speaker or writer wants to be advised. "20% had voted for mɪsˈtʃiːvəs, and 15% had expressed a preference for mɪsˈtʃiːviəs." Am I reading the chart wrong, or are those numbers reversed? I think this is just yet another example of 'the Media' being full of 'mendacious windbags' who prefer prescriptivism and punditry in place of facts. They're projecting *their* prejudices onto you in an attempt to show the public that these ivorytower intellectuals think the polloi are beneath them. In short, they're lying, lying, lying. Sili: well spotted. The chart in the printed book is correct; the one I reproduce here is from the accompanying CD-ROM, which for some reason is wrong. David Crosbie - that seems a sensible answer. I think there's also a debate to be had about whether, and when/where, it is a good idea to advise children to change their speech and writing habits. In the past, schools assumed that a change was good for the children, so they must impose change on them, whether they wanted it or not. Today the approach (in theory, at least) is to convince children of the utility of Standard forms in writing and in formal speech situations in addition to any nonstandard forms that they use in other situations. @David Crosbie: your earlier, longer post about the prescriptivist mindset is really excellent. Props to you, sir. I'll be passing it on to my A level students along with the original post. David Crosbie - so does school itself (in the British sense, i.e. compulsory school for children) count as a formal speech situation? If a child in a lesson pronounces therapy ˈferəpi, should they be taught to substitute θ while speaking in class, or only advised that it might help their chances in some future situations (e.g. job interviews)? I'm not a schoolteacher. In fact I've never taught language to native speakers. But if I were a schoolteacher of English I would view the classroom as a relatively informal speech situation. This could, however, be changed by role play in simulated speech situations that were undoubtedly formal.